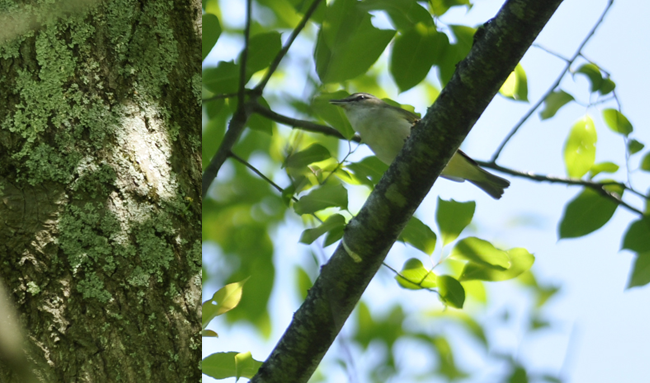 A Red Eyed Vireo calls from a branch in a newly leafed out Choke Cherry ( Prunus virginiana). Sure, I could do a post on what is happening on the ground this week in our forests, but who wants to see another photo of a pink ladyslipper....so today, I got up at the crack of dawn, and went birdwatching. 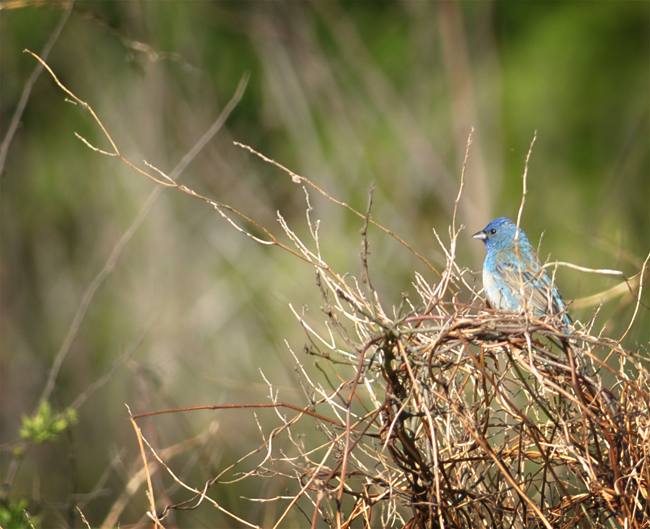 There may be no better time to go birding in the Eastern deciduous forest than in May, just as the new foliage is opening with a green so bright, it can seen almost un-natural. Each week in May brings new migrating song bird species to the forests and meadows here in the Eastern US, and as my guide and neighbor Kim Allen explained ( who is also a fellow blogger ), some decide to stay and mate, raising their brood in territories defined roughly by habitate and food sources, or, they simply stop and rest, on an even longer journey north, into Canada to breed. 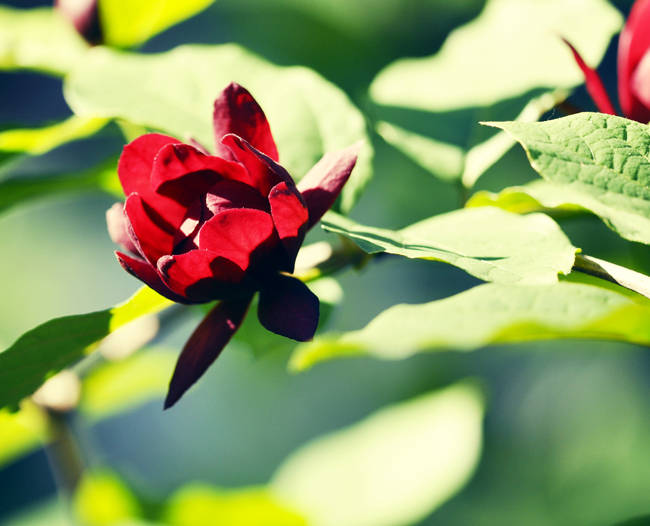 Sinocalycanthus raulstonii 'Hartlage Wine' is an under used shrub, an intergeneric cross between our native Eastern Sweetshrub Calycanthus floridus and the Chinese counterpart, Sinocalycanthus. Still relatively new ( created in the 1990's) the larger this shrub gets, the more I adore it. In many parts of the country, especially here in the North East, this weekend which typically marks the unofficial start of summer, feels more like winter - with ice pellet yesterday, and night-time temps dipping into the 30's tonight, summer seems like a long way away. 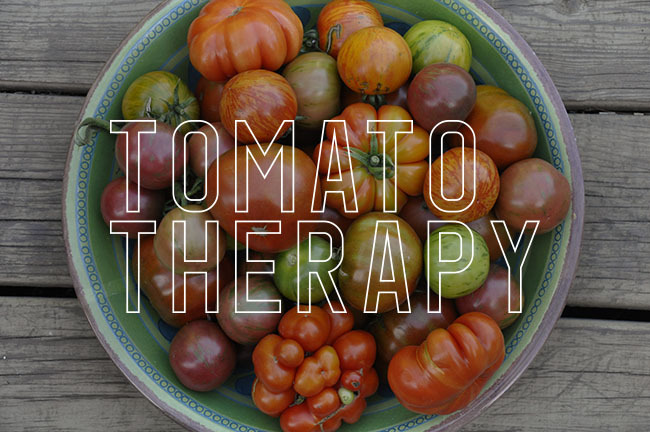 It makes me happy that I have waited until after Memorial day to plant my tender annuals and vegetables ( I just transplanted my seedling tomatoes last weekend! ), but there is no holding back spring, which I can see as I strolled around the garden today during a break in our well-needed rainstorm. The sun broke through the clouds, and even though a bitter, cold breeze kept gloves on even while I weeded, I took some time to snap some shots of some remarkable plants blooming in the garden on this chilly, spring weekend in late May. 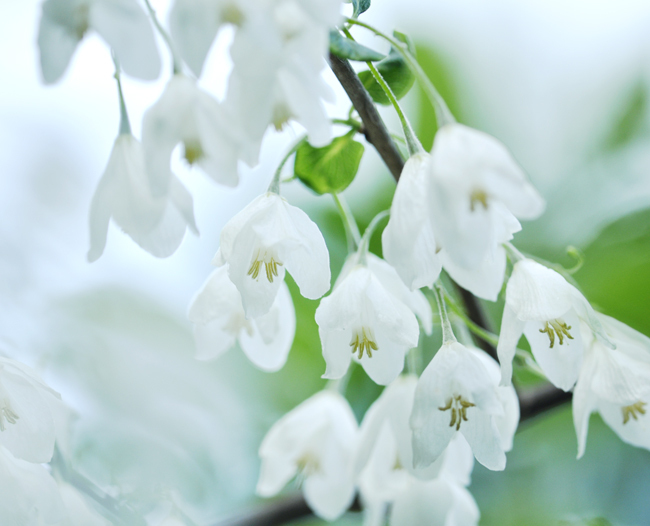 Another native American tree rarely seen in garden is the Snow Bell, or Halesia monticola more commonly seen in mid-Atlantic states than in New England. 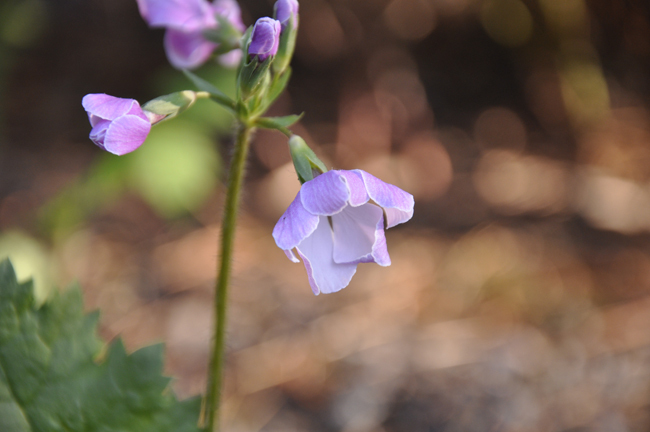 Saruma henryi, a Chinese native woodland plant blooms on the north side of the house. 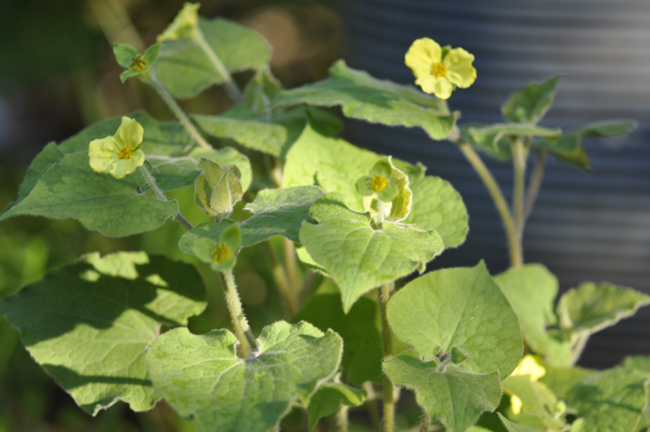 With pale, yellow blossoms and velvety heart-shaped leaves, this shade lover is winning my heart. This year, it is nearly a foot and a half, tall. 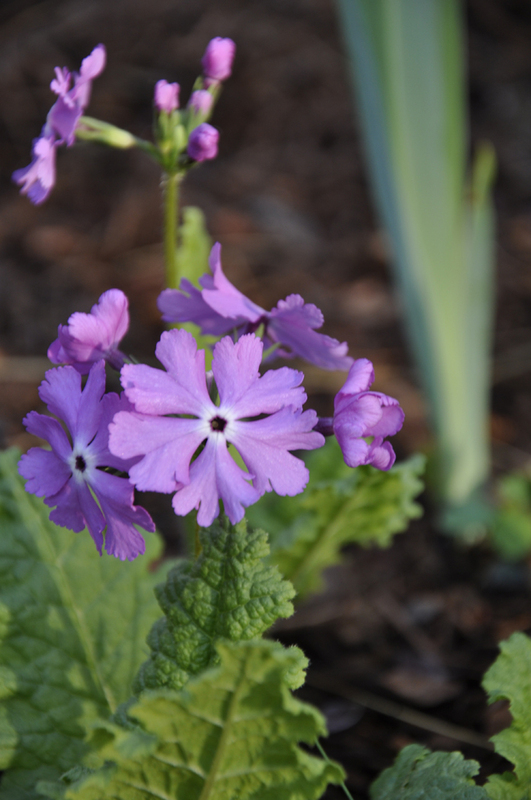 Primula polyneura blooms out near the chicken coops. 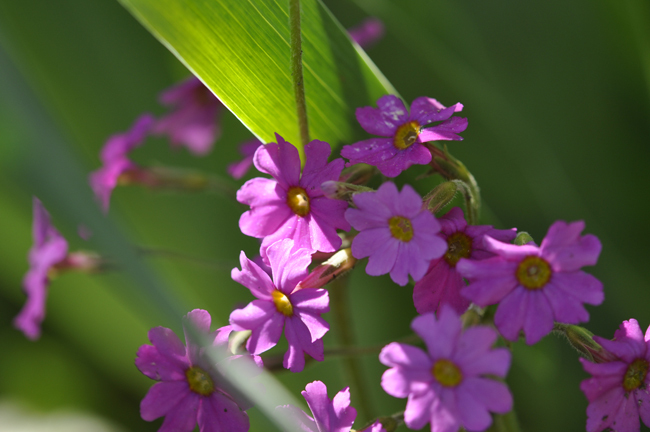 Less thug-like than its close relative, Primula kisoana ( as if P. kisoana is really thug like, but it does spread a little), this primrose has more of a candelabra stem, and blossoms which are more showy in the garden. I have no idea where we got these plants, but I have a colony growing near the woods. 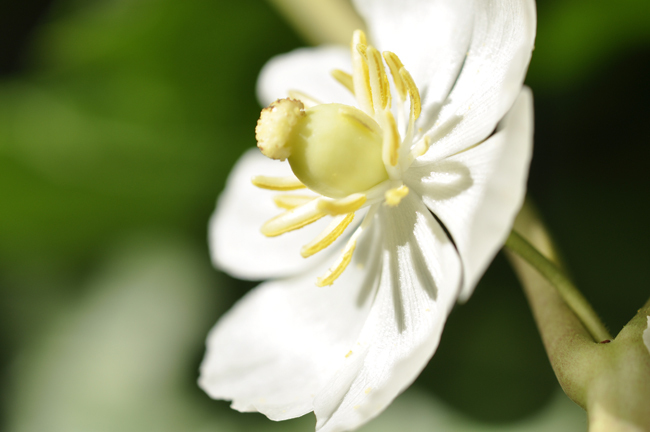 Our native Mayapple has sweet blossoms, but they are always hidden below the umbrella-like foliage of this Podophyllum. I have to pick a few, just to get a photo of the flower which nods below the single leaf. 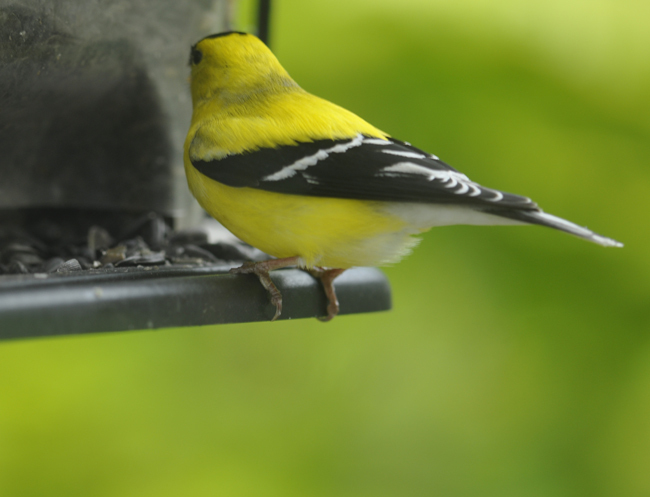 Our Goldfinches are in full, breeding splendor now - with brilliant yellow feathers, they are fearless, visiting some of the feeder near the kitchen window. This one seems to want some sunflower seeds to augment his diet of thistle seed. 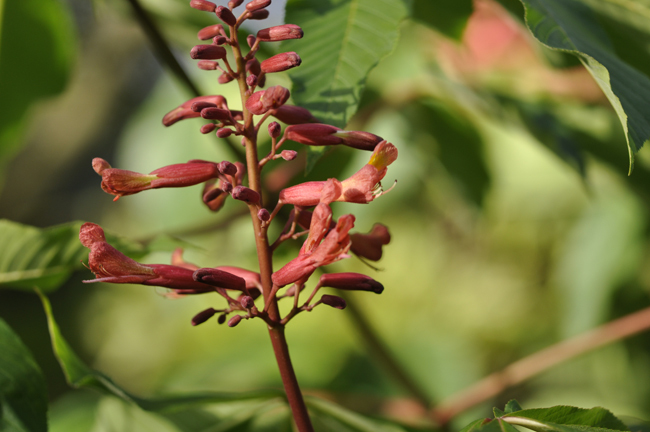 Aesculus pavia, our native red Buckeye, a relative of the Horse Chestnut, brightens a green corner near the greenhouse with it's firecracker-like blossoms. A small tree, this one never seems to get taller than I am. 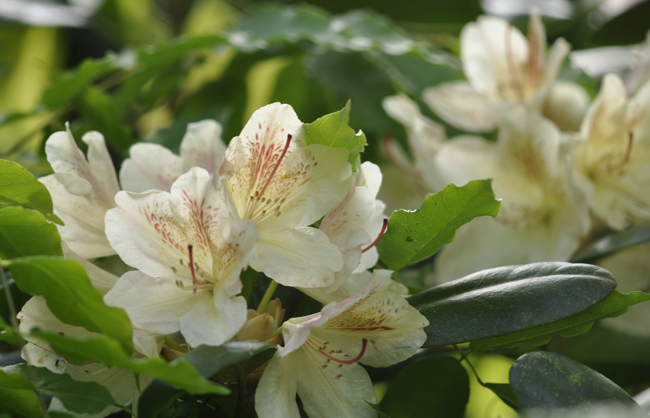 Yellow Rhododendrons remain rare, and this one blooms with trusses that first open pink, then turn bright yellow, and later turning to a pale primrose yellow. I long lost the variety name. 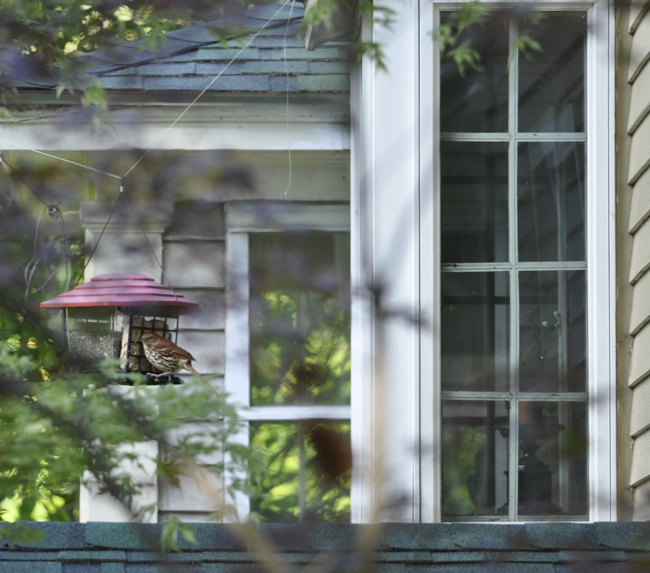 I was so excited to see this visitor to our suet feeders ( which I have decided to keep up for the summer to encourage catbirds, and other insect eaters closer to the house). This Brown Thrasher is a large relative of the Catbird, and as an omnivore, he enjoys both insect and nuts. 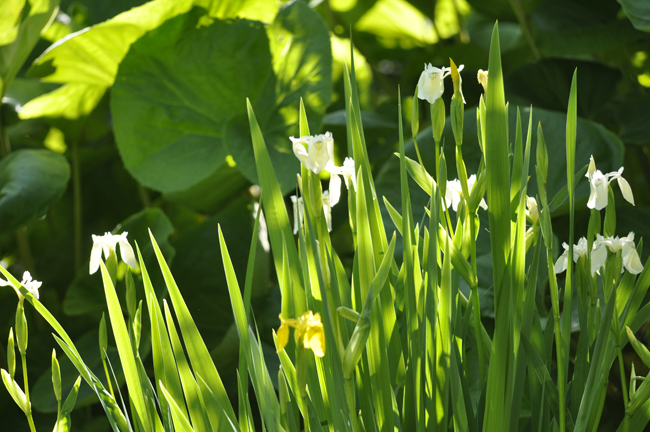 A large (tall) native water iris, Iris pseudacorus blooms in our pond. Nearly 5 feet tall, this is one which we found growing near our fishing spot with white flowers, in the wild, it is more typically yellow ( as in the foreground). 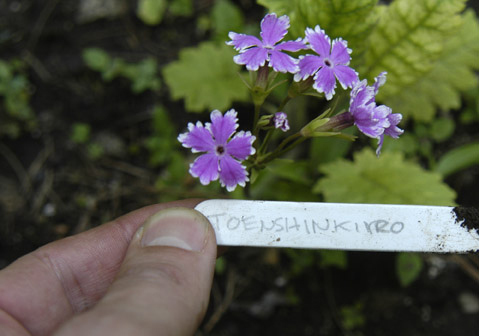 It prefers wet feet, but it also grows well in the border. 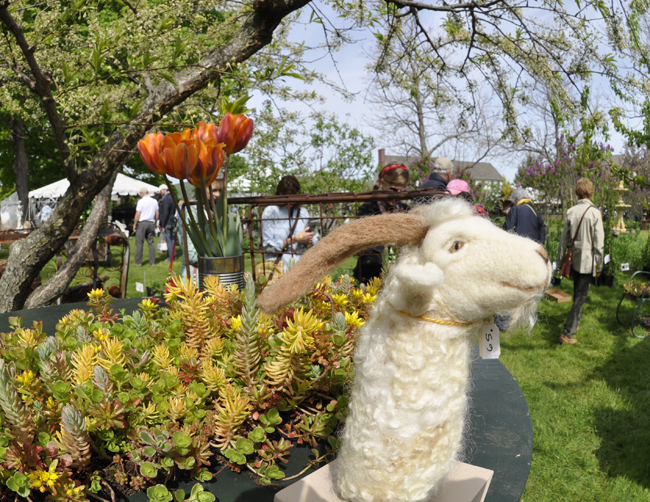 Succulent wall planters and a great felt wool goat puppet ( these are what Martha was buying when I met her!). Aren't they great? 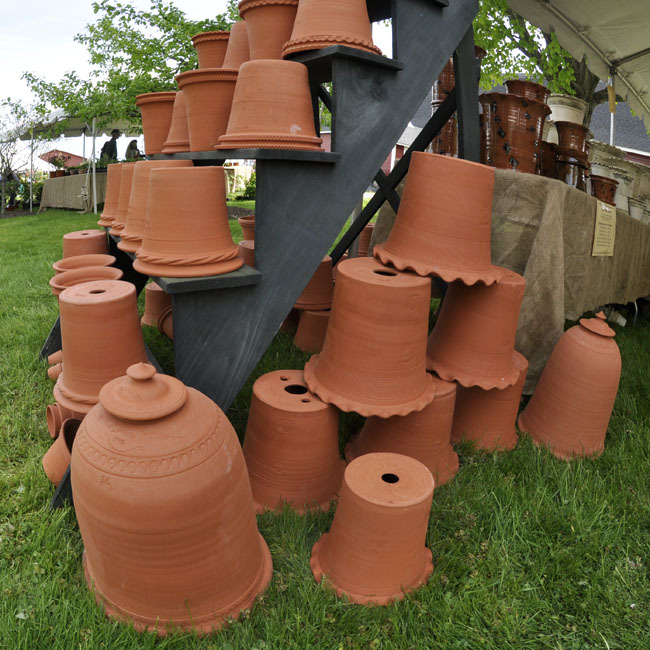 I had so many good photos from last weekend's visit to the rare plant and garden antique show TRADE SECRETS in Sharon, CT, that I thought that I would share more of them. I think you may find these as inspirational as I do. Enjoy! For more pics, click below. If you’re a user of Google Reader you probably know by now that Google has decided to shut down the service as of July 1, 2013. Many people, myself included, use Google Reader on a daily basis and have found it to be the best RSS reader available. Sadly (or not), it's all changing. This post is simply to inform all of my great readers that starting this Thursday, I will be switching from Google Reader to Feedly. I'm not really a geeky type, so I am assuming that many of you are not either. Hopefully all will go smoothly. All this means is that if you get my posts sent to you in an RSS feed, most likely you are using Google Reader. If you are, then you will need to change to another reader, and will need to relink my site. If you use Feedly or one of the many other readers, you will need to make minor adjustments. 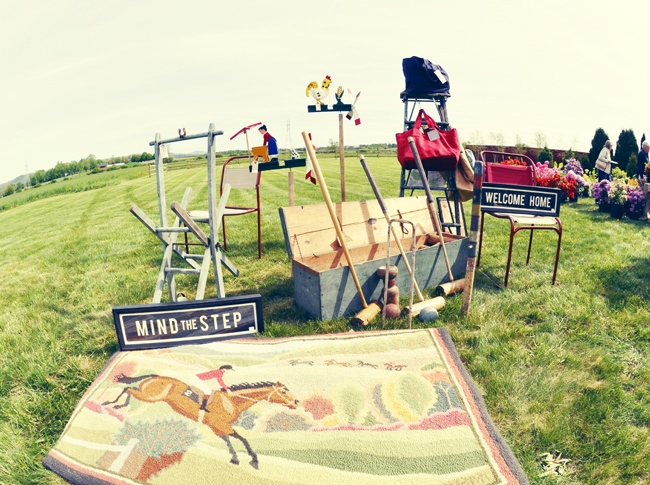 Any questions, or concerns, this article will help you find options. If you just access my blog in your bookmarks, or saved the URL somewhere, nothing will change. This only affects the 1500 Google Reader fans that I have. Whose that with Martha Stewart in the middle of this image? Why, no other than Kevin Sharkey. 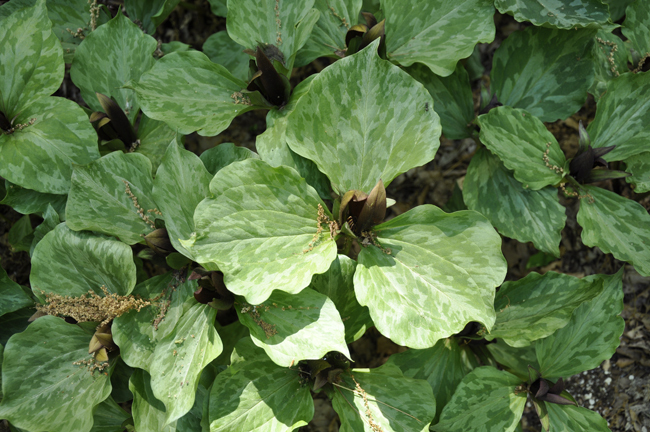 I covet my Podophyllum pleianthum as much as Martha does, which only confirms her secret that many of us in the plant world already knew - that she really does know great plants, and appreciates them too. It's become an annual fete - and one every plant and garden lover should attend, for thirteen years now, the private home and farm of Elaine LaRoache and her Lion Rock Farm in Sharon, CT opens it's gates offering many of us so privileged to attend, access to simple the best in rare and unusual plant, garden sculpture and pottery, and well, imagine jumping into the photo of one of the finest British gardening magazines ala Alice in Wonderland, and you get the picture. Trade Secrets is just that sort of experience. No kidding. 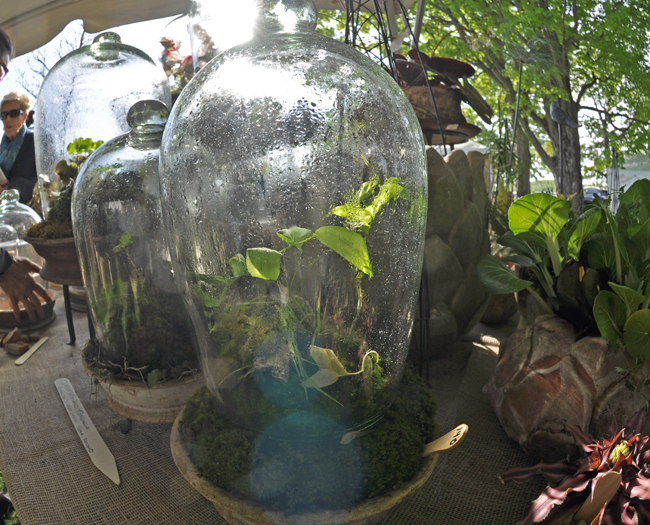 It feels edited, fancy, down-to-earth, and authentic, and the plant material is choice. I should add, I expected everything to be out of my price range, but I barely spent more than $100 for each tree and shrub ( many under $50) but the selection was impeccable. 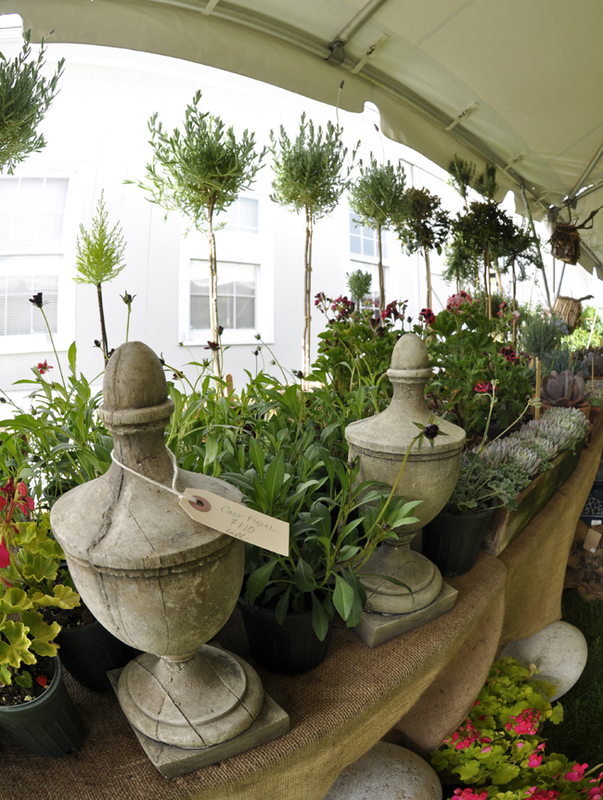 If you are a stylish gardener or even a plant collector living in the New York/New England area, then the posh garden sale/event called TRADE SECRETS, should come as no surprise, most likely you already know of this even, and have made the trek to the small, idyllic Connecticut town of Sharon, CT. What started thirteen years ago by interior designer Bunny Williams, of Bunny Williams Inc ( one of the world's largest and most prestigious commercial design firms), when she started what then seemed to be simply a small fundraiser - a simple plant sale to help raise money for Women's Support Services (WSS provides services to persons in the north west corner of Connecticut who have experienced domestic violence of abuse). 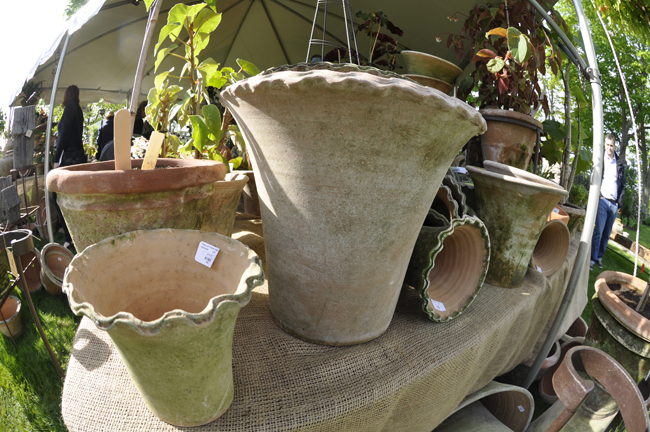 Today, the event has grown into something more like the sales tents at Chelsea crossed with Brimfield Antiques Fair ( on one of those really good days!). Now, throw in rare plants, and you can begin to get an idea of what Trade Secrets is like. Here are just a few of the many things that I saw. 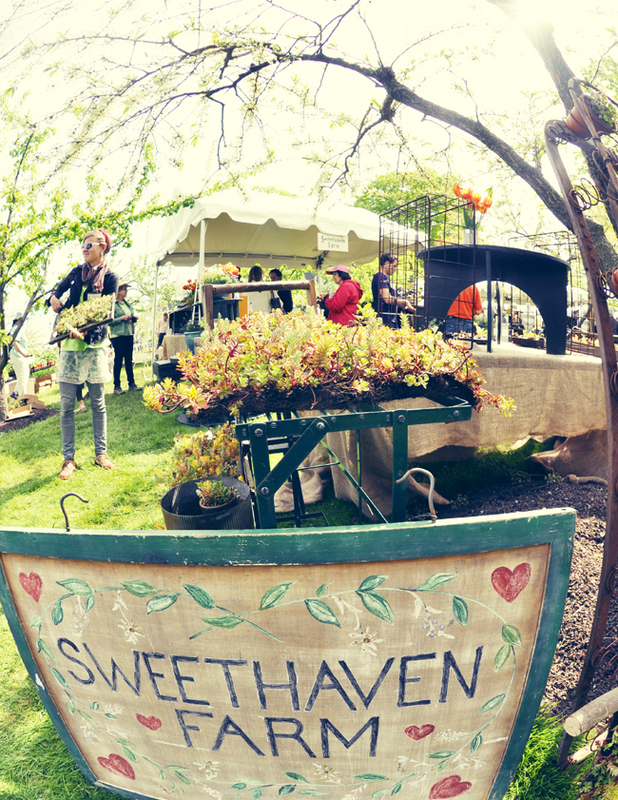 First time exhibitor, our friends from Kennebunk, Maine, Thanks to the always inspiring and talented Todd Carr from Snug Harbor Farm. 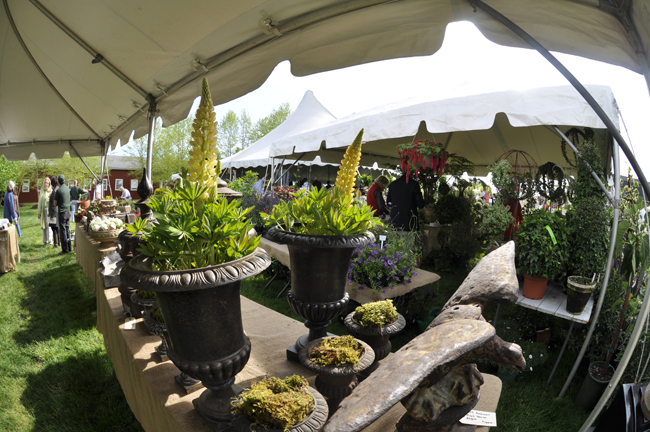 I drifted between the beautiful and tempting displays of some of my most favorite nurseries, from Ed Bowen's Opus Nursery, to this year newb Todd from Snug Harbor Farm in Kennebunk Maine, and the impressive work of Todd Carr. 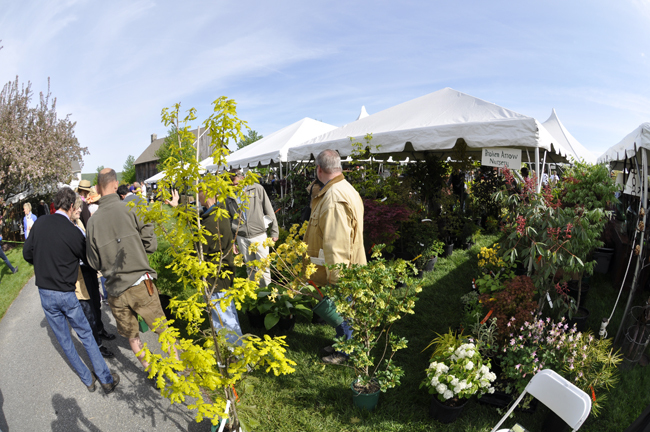 Broken Arrow Nursery is clearly everyones first go-to booth, for rare trees and shrubs ( thier Davidia involucrata in full bloom kept iphones and cameras out. 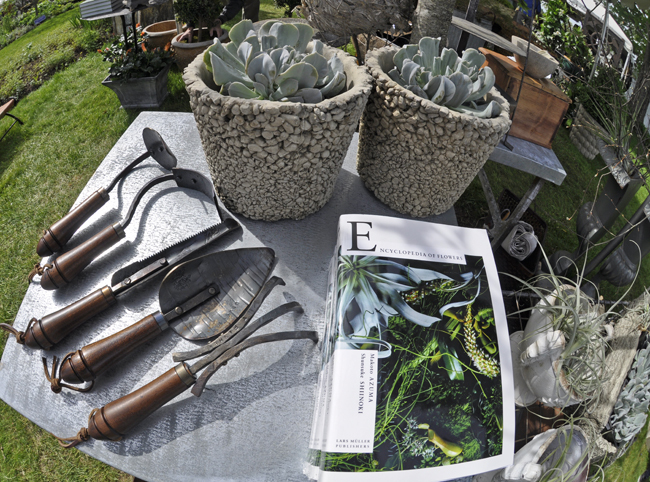 Hand made garden tools, books, as well as plants were for sale. I was so happy to be able to meet Guy Wolff today. We've chatted on line, and we even tried to meet up a few times but things just got in the way. Of course this is his territory - his studio is nearby. 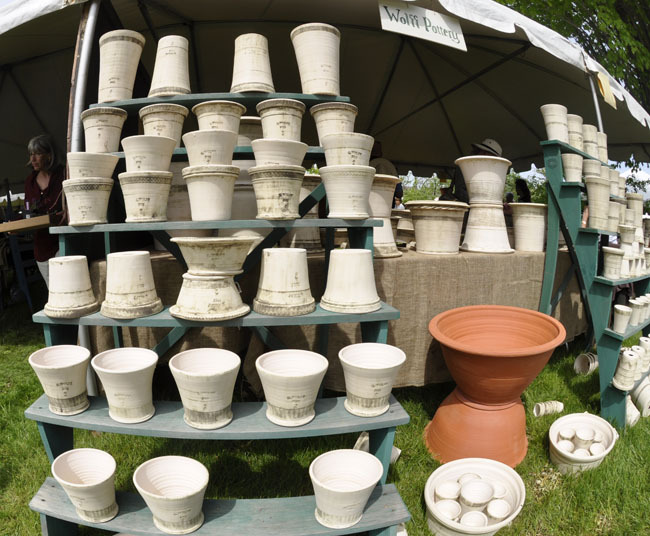 and we buy our clay just up the road at the same place, Sheffield Pottery. So really, there is no excuse. 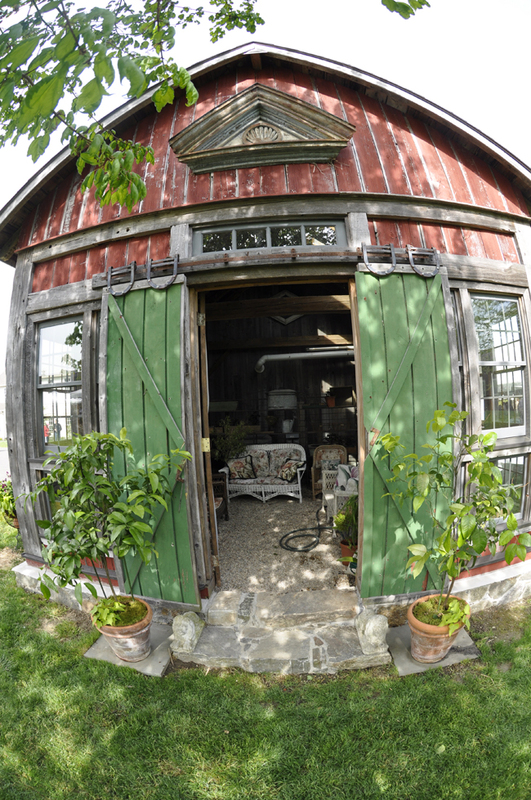 I really need to go spend some time in his studio. Guy's always so warm and nice, and approachable. People just smile when he chats with them. I could have spent a gillion dollars....but my lottery ticket won't be available until tonight, when I will the big one.....but I still left with a huge Guy Wolff Rhubard forcer! Joy. I have always wanted one. Well, ten, but I can start with one. 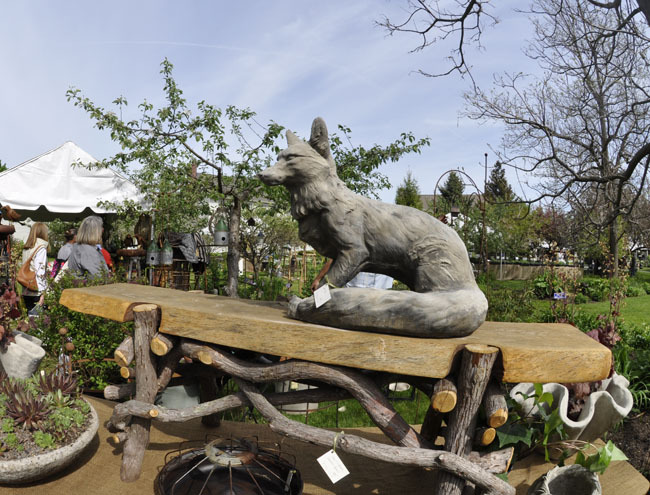 I fell in love with this fox, but it was out of my price range. 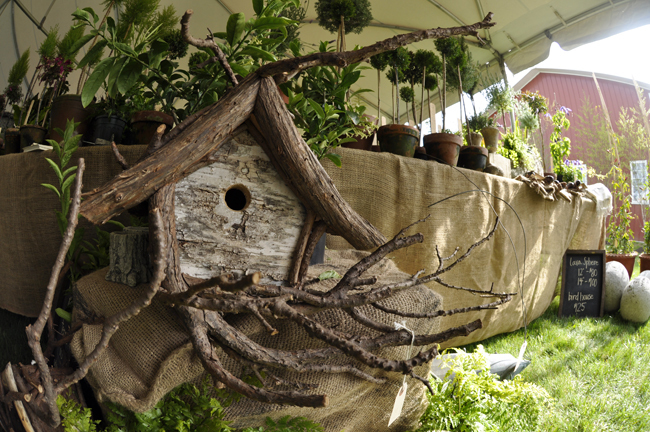 I also had to leave with this fabulous bird house from Snug Harbor Nursery. It was so well made. 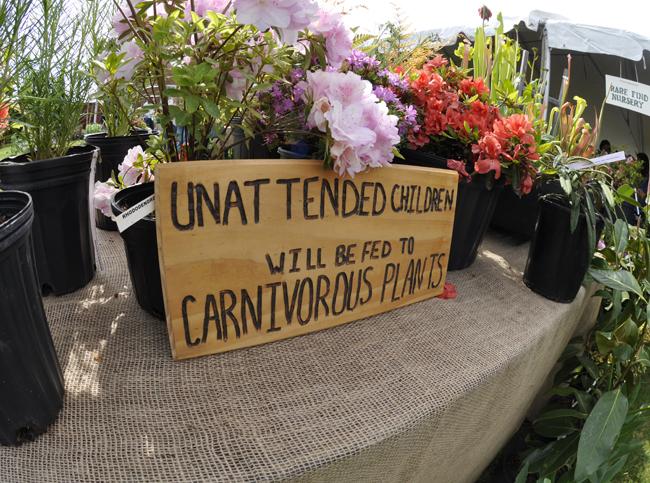 Yes, there were plants too. Oh, the plants. Nothing common, which made for some challenging budgeting. I did leave with the golden English Oak and a few amazing plants from every one's fav nursery, Broken Arrow Nursery in CT. Thank God I paid the extra fee for early admission. 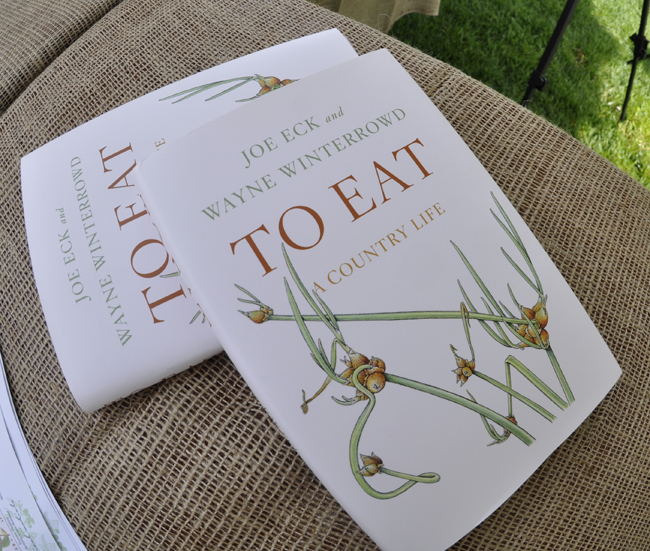 I was delighted to be introduced to these beautiful copper plate illustrations by botanical illustrator Bobbi Angell, who just finished illustrating the latest ( and, sadly, last) book by Joe Eck and the late Wayne Winterrowd entitled TO EAT - A COUNTRY LIFE, which will be published on June 11, 2013. 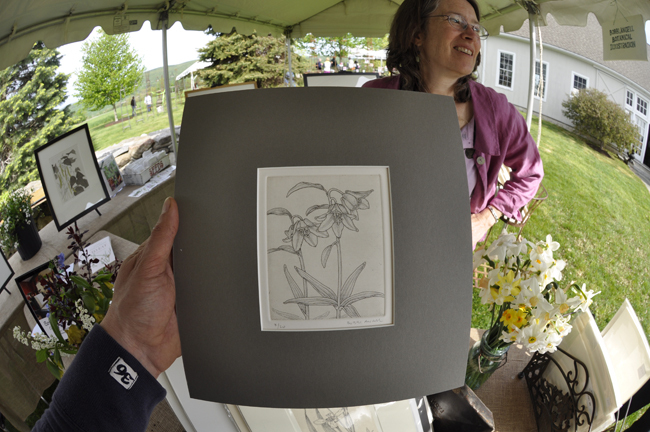 Bobbi's illustrations are remarkable, not just because of her style and talent, but becauseshe too is a gardener, if not a horticulturist so there are illustrations of horticulturally interesting plants. 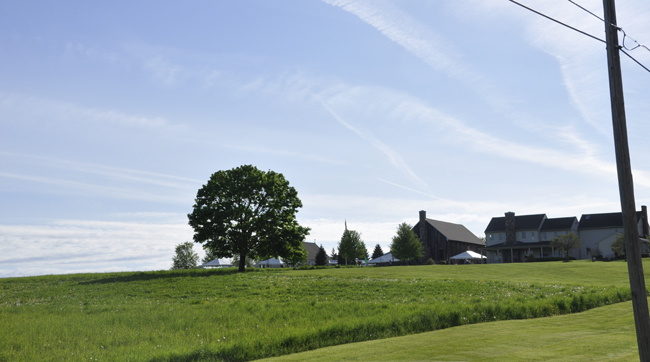 The rural farm, where the even is held in Litchfield County, CT, near the Massachusetts and New York border. There are days in May when everything comes together like kismet, bright sunshine, blue skies, warm temperatures, migrating warblers, and woodland wildflowers. Today, my good friend Joseph Tychonievich ( from Arrowhead Alpines) visited me, and we spent the day touring my lousy garden, then lunch and a visit to the Garden in the Woods, in Framingham, Massachusetts. 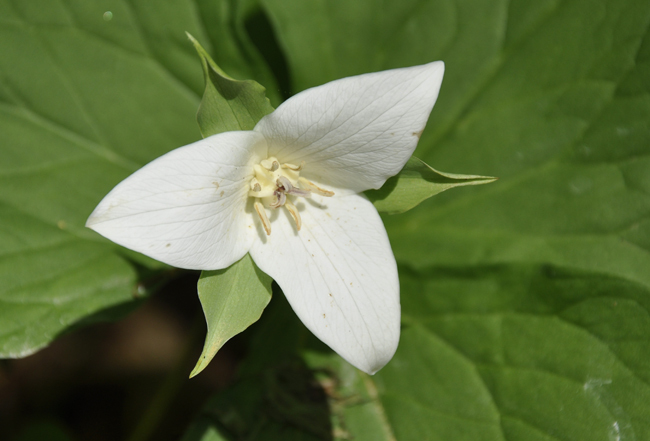 Run by the New England Wildflower Society this renowned botanic garden is special enough, but never so special as it is in mid-spring, when the trillium species bloom. Joseph and I could not have planned a more perfect day to hike the trails, and to visit the propagation beds ( where were you Dan Jaffe?! I know, we should have called first). 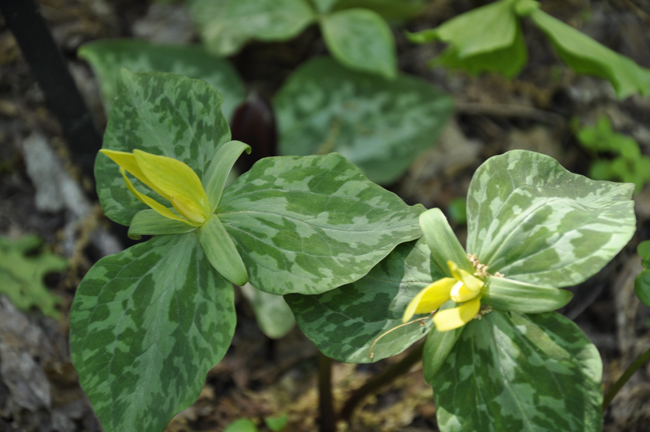 These trillium beds show the fine work of propagator, Dan Jaffe.). Mr. Jaffe was probably resting while his trillium beds bloomed their butts. We stopped to take some photos of the many trillium species, and to catch a few birds - a Rose Breasted Grosbeak and a Baltimore Oriole sang high in the oak canopy. 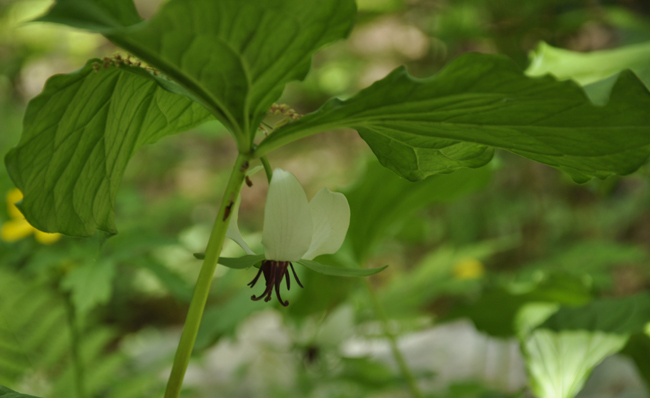 Trillium grandiflorum in massive clumps. Joseph's new book which I will be reviewing soon ( as soon as I get on from his publisher) PLANT BREEDING FOR THE HOME GARDENER (2013 Timber Press)sounds more than terrific, it sounds practical and even fun, as just talking about it with Joseph had inspired me want to go try some plant breeding again - something I do every now and then, but not nearly at the level that Joseph does. I hear the book is selling out fast, so be sure to try and order one before it goes into a second edition. Raising your own varieties from seed has many benefits, and as Joseph and I chatted, I soon realized that we both shared a lot of the same concerns about growth regulators used on annuals and most commercial crops ( most every thing at big box stores) and how this limits performance in the home garden significantly ( it's why many annuals that we buy in-bloom in six packs, fail once planted into our own gardens. 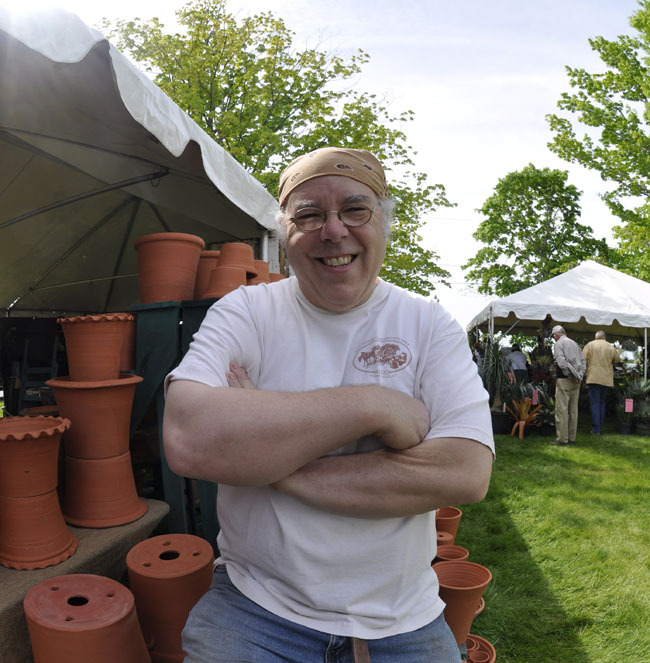 Joseph's book will show you step-by-step how to try your own hand at crossing your own annuals and veggies, and even how to develop some of your very own original varieties and selections. 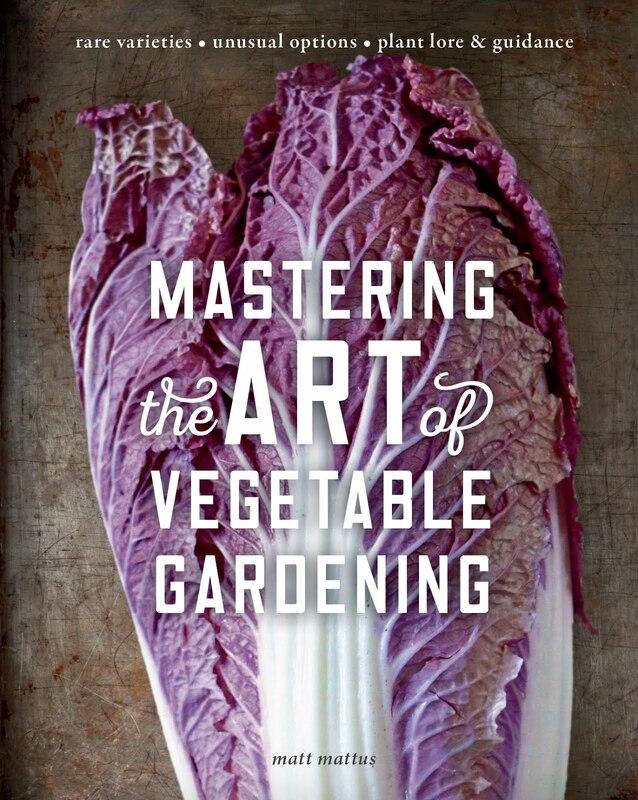 Even if you are interested in saving your own seed, this book will be essential. Go find one now! Back to the trillium species at Garden in the Woods - the stock beds reminded both of us why we want to continue starting our own trillium from seed, yet we joked at the time involved ( sometimes taking more than 5 years to bloom from seed) and we shared hints and secrets about Gibberelic acid, sowing fresh or green seed, and division as alternate methods. 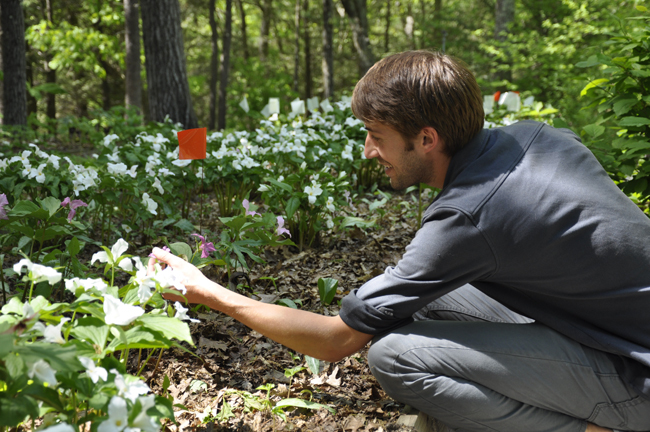 Joseph's nursery carries and impressive selection of trillium species ( as well as many other native woodland plants from North America), but it's always fun to see how other people are growing them. 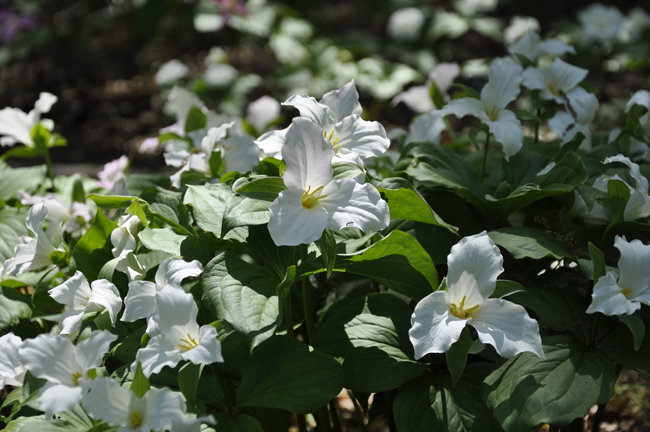 One rarely sees any trillium in such numbers, it's a precious and rare site for any garden or plant enthusiast. 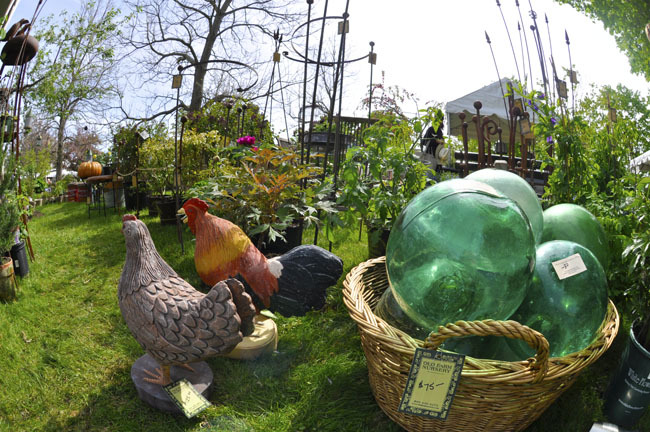 Bothe Joseph and I were overwhelmed by some of the selections in the raised stock beds. Clearly, Dan has been doing some creative work here. 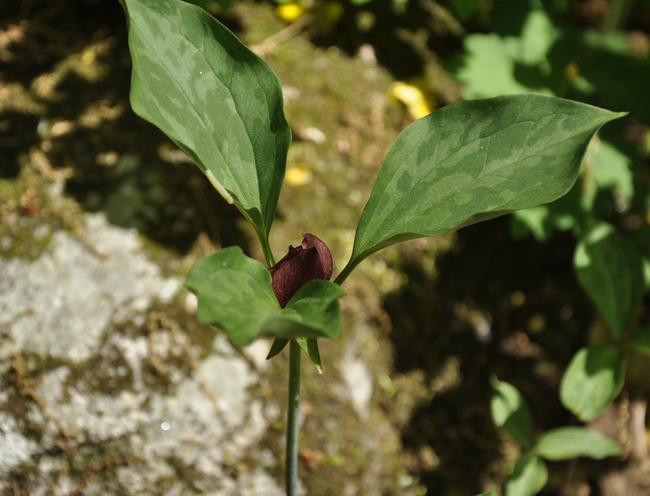 Trillium grandiflorum cv. 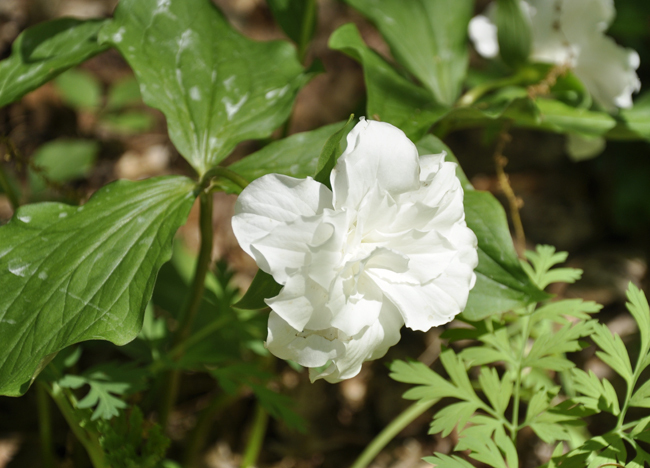 multiplex, the double white Wakerobin, or double trillium. 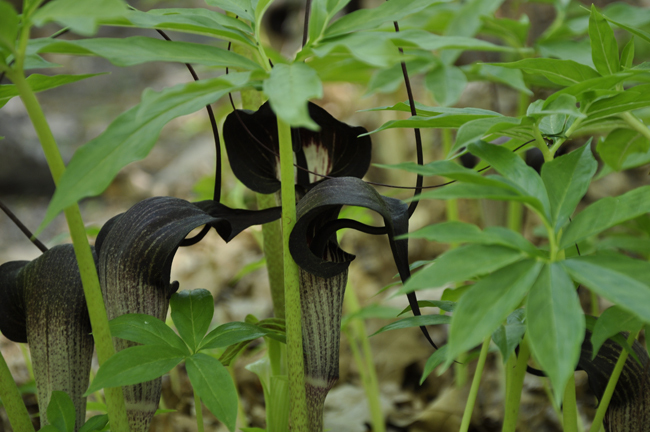 Gotta love my fav, Arisaema thunbergii ssp urashima ( I think, just guessing here, but it is my favorite and I get to see it so rarely). Love those little 'mouse tails' emerging from the spadix. geisha types which are so treasured in Japan. 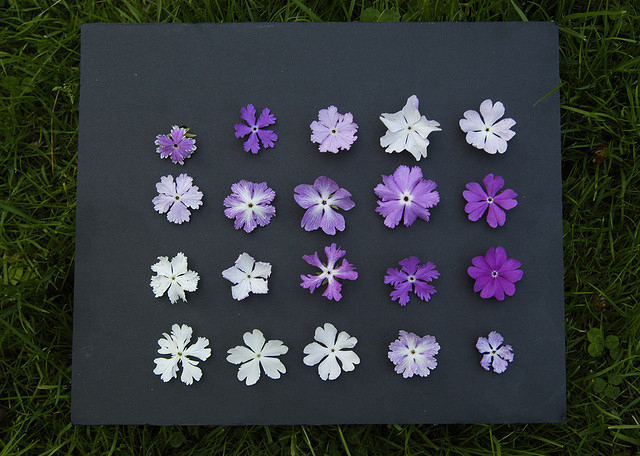 In the great world of primroses, there are hundreds of species, most, unfortunately never make it into our gardens for various reasons, either nurseries rarely carry them, they are simply hard to find, or home gardeners simply don't know about them. 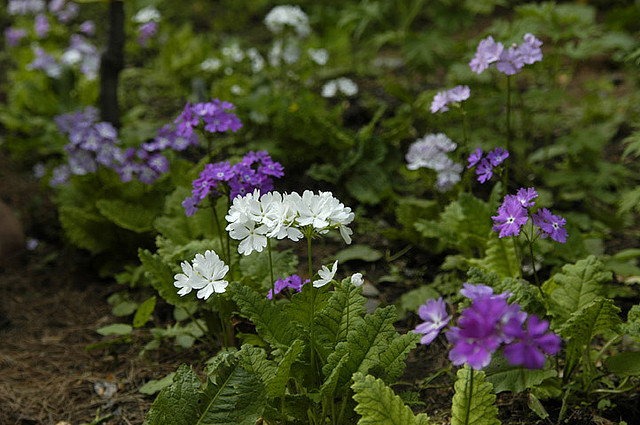 The early-blooming delicate woodland primrose, Primula sieboldii from Japan, is one such plant. 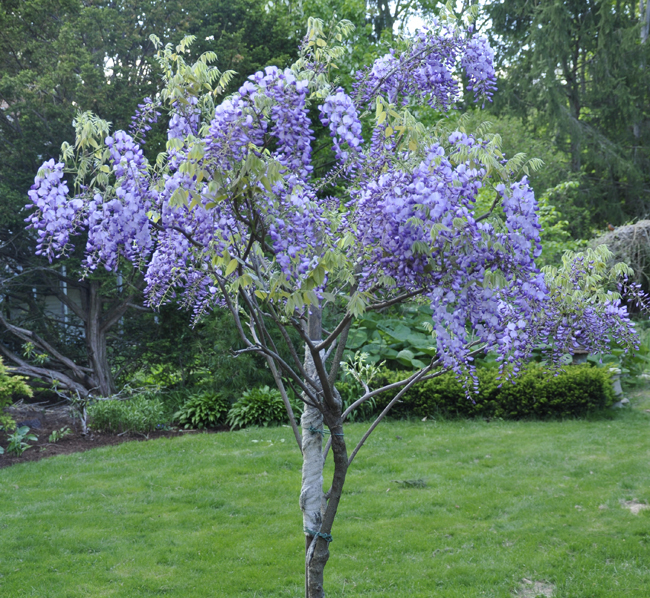 A species with hundreds of fabulous selections so treasured in Japan where there are clubs, public parks and even events organized around the blooming of this plant, here in America, just try finding even one selection. 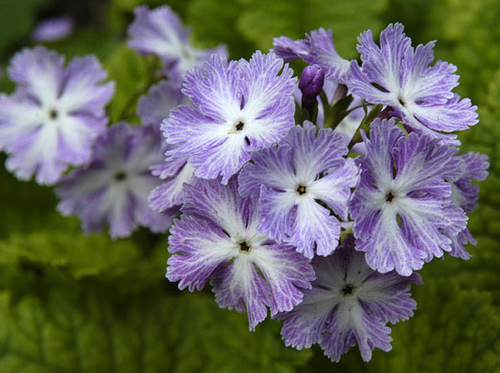 It takes some work, but there are a handful of nurseries ( mostly on-line sources) who carry this creeping, barely a ground cover but certainly mat-forming perennial primrose. I say - find one, and see for yourself how wonderful this plant is. 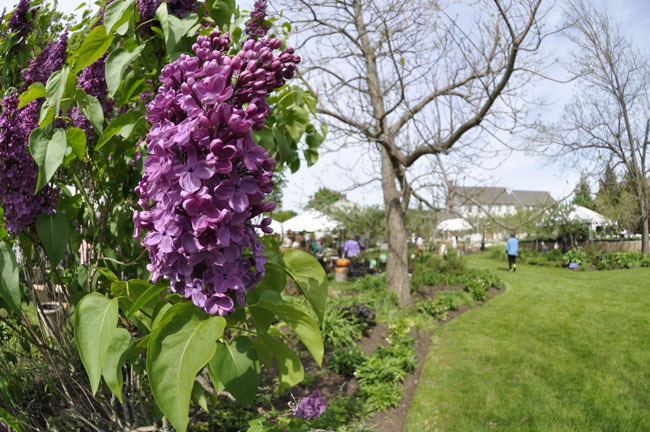 Then throw away your creeping phlox that everyone has, and raise-the-bar horticulturally in your neighborhood. I love this lavender veined form. I took this photo two years ago, but sadly, I think we've lost this selection. with the hopes of finding even more, better, selections. More-better. Yeah. 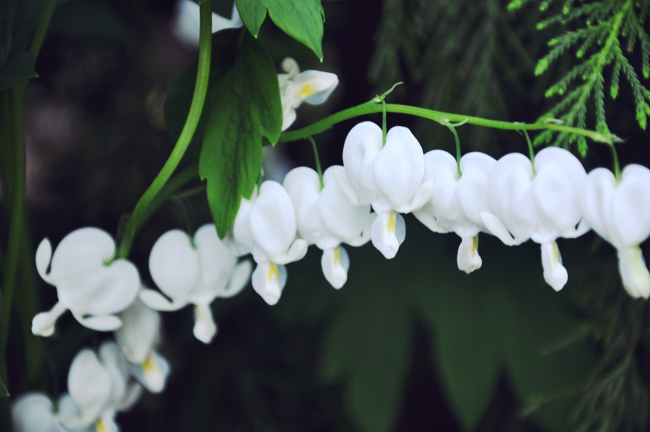 Nostalgic plants return year after year, often reminding us of our earliest gardening experiences, and so it is with the common Bleeding Heart, typically found in its pink form, this white selection is less common. This nodding form is a favorite in Japan, as it expresses a more demure gesture, so appreciated there. This selection is called 'Pink Geisha'. 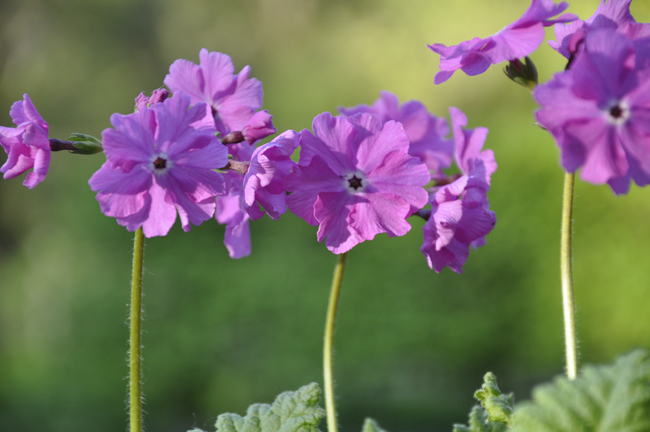 Our Primula sieboldii brighten the spring garden, as they grow in woodland-like duff below trees in partial shade.